On this date in 1940 in Holland, the Ger­man Luft­waffe bombed Rotter­dam’s medi­e­val city cen­ter, killing nearly 1,000 people and leaving 85,000 home­less. Rather than endure more bombings—leaf­lets dropped on Utrecht indi­cated it was next Dutch city in Ger­man cross­hairs—the Dutch Army surren­dered the next day. The Ger­man offen­sive against the Low Coun­tries had been launched four days earlier, on May 10, with­out a decla­ra­tion of war before­hand, when Ger­man air­borne/air­landing assault divi­sions and ground forces began seizing stra­te­gic loca­tions in Holland and Bel­gium. The sur­prise assault on the Low Coun­tries was part of Fall Gelb (Case Yellow), a Ger­man oper­a­tion that in­cluded attacking France, which, like Great Brit­ain, had been at war with Ger­many since Sep­tem­ber 3, 1939, two days after Adolf Hitler had unleashed the Wehr­macht (German armed forces) on his east­ern neigh­bor, Poland. Fighting con­tin­ued along the Dutch-Bel­gian border, where several Dutch bat­ta­lions, aided by French units, put up a limited defense. It was in Bel­gium, in prin­ciple neutral, that France moved to halt the Ger­man advance, believing its north­ern neigh­bor to be the Wehr­macht’s main thrust in the West. After the French had fully committed the best of their armies in defense of Bel­gium between May 10 and 12, the Ger­mans enacted the second phase of Fall Gelb, a sickle-cut through the heavily forested and rough terrain of the Ar­dennes in Southern Bel­gium and Luxem­bourg, devoid of Allied forces, and advanced toward the northern French coast. The Ger­mans reached the Eng­lish Chan­nel after five days, en­circling the French, Bel­gian, and Brit­ish armies. (A Brit­ish Expe­di­tionary Force had been deployed mainly along the Belgian-French border since Sep­tem­ber 1939.) The Ger­mans grad­u­ally shrank the Allied pocket to the beaches and harbor at Dun­kirk. The Bel­gian Army capit­u­lated on May 28, 1940. The Ger­mans would have totally anni­hi­lated the British and French armies had it not been for the extraor­di­nary im­promptu evac­u­ation of 198,229 Brit­ish and 139,997 French service­men from Dun­kirk between May 27 and the morning of June 4, 1940. The “Miracle of Dun­kirk” provided a psycho­logi­cal boost to Brit­ish morale, and the rescued Brit­ish troops pro­vided the nucleus of the Brit­ish Army that returned to help liberate the continent in 1944. 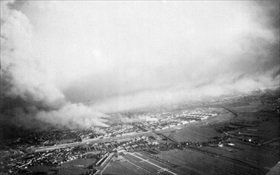 Left: Rotterdam’s burning city center after the bombing. The Ger­mans called such bombings Schreck­lich­keit—“fright­ful­ness.” After the Luft­waffe targeted Rotter­dam in what became known as the Rotter­dam Blitz, the Royal Air Force aban­doned its policy of not delib­erately bombing civil­ian pro­perty in Ger­many. On the night of May 15/16, 1940, the RAF made its first raid on the inte­rior of Ger­many, attacking civil­ian indus­trial tar­gets in the Ruhr dis­trict that aided the German war effort. 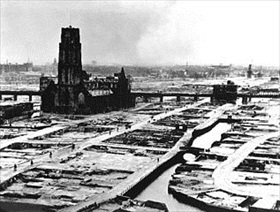 Right: The heavily damaged Laurens­kerk (St. Law­rence Church) and Rotter­dam’s med­i­eval city cen­ter after the removal of bomb debris. Around one square mile of the city was nearly leveled in less than an hour, and 24,978 homes, 24 churches, 2,320 stores, 775 ware­houses, and 62 schools were destroyed. 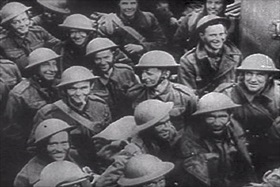 Left: Rescued British troops gathered on a ship at Dunkirk (Dunkerque), Northern France, where, according to Prime Minis­ter Winston Chur­chill, “the whole root, core, and brain of the British Army” was trapped. For every seven British and French soldiers who were rescued in what was named Oper­a­tion Dyna­mo, one man was left behind as a pri­soner of war, even­tually ending up in Ger­many. Those below the rank of cor­po­ral worked as slave laborers in Ger­man indus­try and agri­cul­ture for the duration of the war. 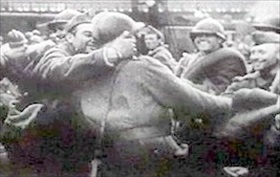 Right: Dunkirk-rescued French troops dis­em­barking at a port on the south coast of Eng­land. Of the French sol­diers evacu­ated from Dun­kirk, only about 3,000 chose to con­tinue the struggle against Nazi Ger­many, joining Charles de Gaulle’s Free French Forces (Forces françaises libres) in London. The rest were repatri­ated back to France, where about one half were redeployed against the Ger­mans before the Franco-Ger­man armis­tice at Com­piègne was signed on June 22, 1940, after which they were made POWs by the German Army.